The Battle of Ontario returned to Belleville tonight as the Marlies visited their North Division rivals for a midweek matchup. Tonight’s game had major playoff implications for the Senators who were fighting for their postseason lives, and they came out hungry in the opening frame. Joseph LaBate opened the scoring for the Senators at 10:51, assisted by Christian Wolanin and Darren Archibald. 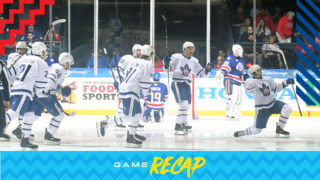 The Marlies responded late in the frame as Adam Brooks redirected a point shot from Kristians Rubins into the back of the net. 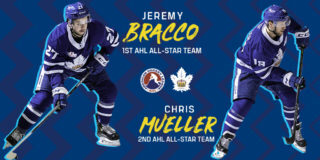 Jeremy Bracco picked up the secondary assist on Brooks’ 21stof the season. Shots on goal in the opening frame were 7-6 in favour of the Marlies and the score stayed locked at 1-1 after 20 minutes of play. The Senators restored their lead at 3:36 of the second period, capitalizing on a power play opportunity. Jack Rodewald notched the power play goal, assisted by Drake Batherson and Wolanin. The Marlies struck again at 12:38 as Mason Marchment beat out two defenders in a foot race and evened things back up with a strong individual effort. Rasmus Sandin assisted on the goal. 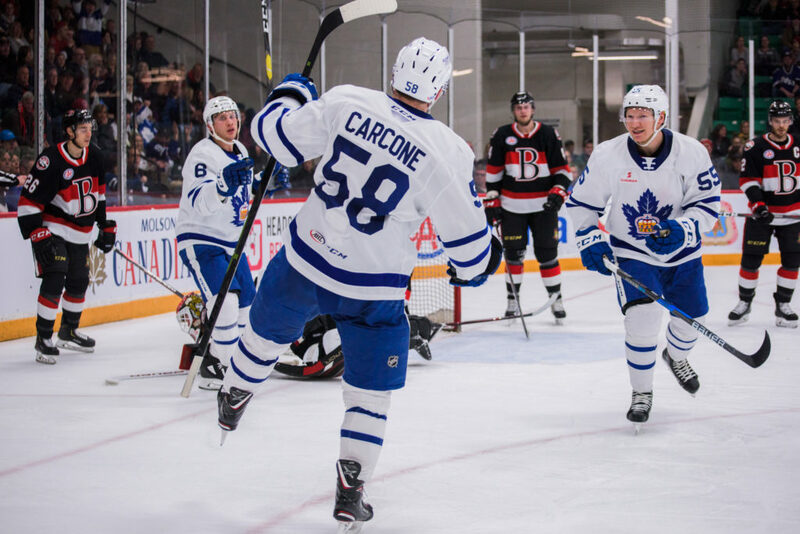 Just over a minute later, the Marlies took their first lead of the night as Michael Carcone finished off a nice play from Steve Oleksy. Andreas Borgman picked up the extra assist on Carcone’s 20thof the season. Shots on goal in the second period were 15-12 in favour of the Marlies and they held a 3-2 lead after 40 minutes of play. Belleville came close to evening the score in the third, but Kasimir Kaskisuo was the difference maker, coming up with some key saves for the Marlies to preserve their 3-2 lead. 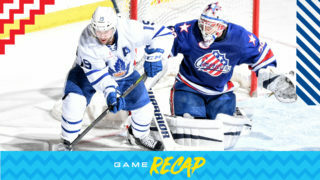 The Marlies had an opportunity to notch an insurance goal with a 5-on-3 midway through the game but were unable to capitalize on the two-man advantage. The Marlies held on to their one-goal lead for the remainder of the frame, picking up a big two points in their final road game of the regular season. The Marlies will head home to close out the regular season with a doubleheader weekend at Coca-Cola Coliseum. They host the Senators on Saturday for a 4:00 PM start, and the Cleveland Monsters on Sunday for another 4:00 PM start. Adam Brooks scored at 17::43 of the first period. Brooks has recorded goals (2) in consecutive games. Brooks has 40 points (21 goals, 19 assists) in 60 games. Mason Marchment scored at 12:38 of the second period. Marchment has collected goals (2) in consecutive games. Marchment has 25 points (13 goals, 12 assists) in 43 games. Michael Carcone scored at 13:56 of the second period. This was his fifth game-winning goal of the season and his 20th goal of the season, matching his career high of 27 points. Kristians Rubins recorded the primary assist on Brooks’ first period goal. This was Rubins’ second assist in 13 games with Toronto this season. Jeremy Bracco registered the secondary assist on Brooks’ first period goal. Bracco has 13 points (4 goals. 9 assists) in 11 games against Belleville. Bracco has recorded 29 points (7 goals, 22 assists) in his last 23 games. He leads the AHL in points (78). Rasmus Sandin picked up the lone assist on Marchment’s second period goal. Sandin has collected 27 points (6 goals, 21 assists) in 43 games this season. Andreas Borgman had the primary assist on Carcone’s second period goal. Borgman has 17 points (goals, 13 assists) through 44 games. Steve Oleksy recorded the secondary assist on Carcone’s second period goal. Oleksy has seven points (2 goals, 5 assists) in 37 games with Toronto this season. Kasimir Kaskisuo stopped 25 of 27 shots he faced. Kaskisuo is now 12-9-3-1 on the season with a .895 Save Percentage and a 3.07 Goals Against Average. Toronto is 24-10-5-2 since January 4 and have outscored their opponents 129-113, facing 17 different teams. In 31 of 41 games, Toronto has earned at least a point (55). Toronto was 3-for-4 for on the penalty kill and was 0-for-3 on the power play. This is only the sixth time on the road the Marlies have been held without a goal on the power play. Toronto had a 29-27 edge in shots in all situations. Jeremy Bracco led the Marlies with four shots on goal. The Marlies are 27-14-8-3 against North Division opponents and are 4-4-3-0 against the Senators. The Marlies are 14-7-3-1 when tied after the first period and 29-1-2-1 when leading after the second period. Toronto is 18-11-4-2 when outshooting their opponent. The Marlies are 7-5-0-1 in Wednesday games and are 2-1-1-0 in April. I like it a lot. We know what’s at stake for our opponent and we tried to challenge our team to rise to that occasion and recognize that playoff hockey is just around the corner here and we’ve got a team in Belleville that’s playing for their playoff lives. We wanted to meet that challenge and I thought our guys did. I thought we played a good game, a responsible game, not a perfect game by any means. It was a pretty responsible effort from our guys, a good positive step here for us as we start to close the book on the regular season. He’s been really good for a long enough period of time now here where you’re not going into the game uncertain about what you’re going to get. He’s been really consistent and we feel good about him back there. We knew with the talent that (Belleville) has and what’s at stake, we knew they were going to come and there was going to be chances. There weren’t a great deal of them but when there were, he was really good. All the way through, I thought it was a really solid effort from our team and I’m really happy that we were able to put together a game like this considering there’s nothing at stake for our team, other than the preparation for playoffs so that could be a challenge mentally and I thought that our guys met that challenge today. The Toronto Marlies kick off their final week of regular season action tonight in Belleville, for a divisional matchup against the Senators. 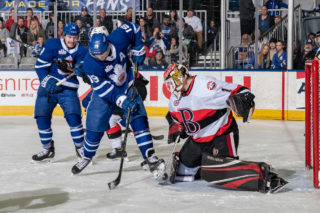 While the Marlies have secured their spot in the 2019 Calder Cup Playoffs, this game has major playoff implications for Belleville Senators who are fighting for their postseason lives. 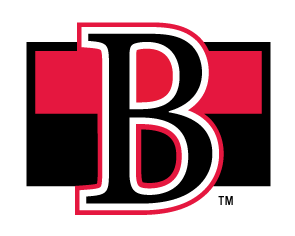 The Senators currently sit in fifth place in the North Division with 80 points, one point behind the Cleveland Monsters. 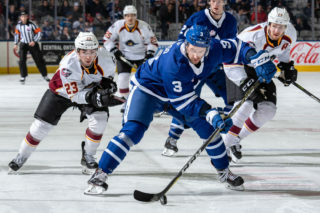 The Marlies will have their work cut out for them against a hungry Belleville team who are coming into tonight’s game fresh off a big 3-1 win over the Monsters. The Senators currently hold a 7-3 lead in the season series against Toronto, and five of the 10 meetings between these Ontario rivals have required an overtime or shootout decision. The Senators have edged the Marlies twice in overtime and once in regulation in their last three meetings, all of which were played in Toronto. 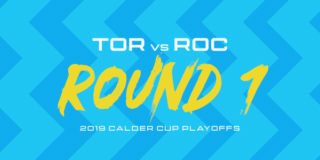 Being on the road could prove beneficial to the Marlies who have seen a lot of success this season (22-9-3-3) when playing away from the Coliseum. Players to watch: Jeremy Bracco registered two points on Saturday and has recorded 28 points (7 goals, 21 assists) in his last 22 games. He is tied for the AHL lead in points (77). With a goal on Saturday, Chris Mueller hit a career-high for power play goals (16) in a season. Mueller has 65 points (33 goals, 32 assists) in 58 games this season. Belleville rookie Drake Batherson has registered a point in every game he’s appeared in against the Marlies this season. He has recorded 20 points (seven goals, 13 assists) in eight games against Toronto and leads the Senators with 58 points (22 goals, 36 assists). Puck drops at 7:00 PM on AHLTV.